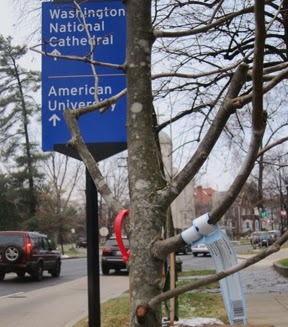 Look for 8 new trees in a line marching north from the busy corner of Mass Ave and 34th Streets by the Norway Embassy. They're all silver linden - Tilia tomentosa - in an even-spaced row to replicate the historic landscape of Mass Ave. Restore Mass Ave suggested planting this row after the trees there were lost in storms. We're grateful to the city Urban Forestry Administration (UFA/DDOT) for planting this row. 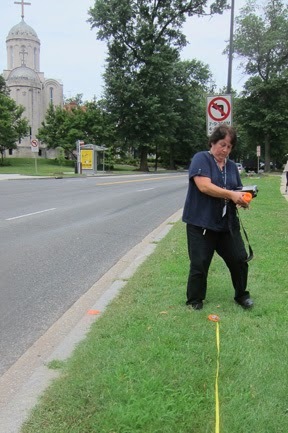 In the photos below, taken last summer, UFA Arborist Vera (Munevver) Ertem marks where the new trees will be planted. The left photo shows the huge stump of the 100+year old tree that had been lost. At right Vera measures from one tree's center to the next, so they would be evenly spaced. What's the pink dot on the curb? It is UFA-speak for plant tree here! 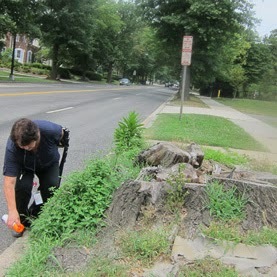 During her visit, Vera spotted other holes in the long lines of tilia by the curb in front of the forest opposite the Naval Observatory/Vice President's Residence. So she painted more red dots, thus deciding another 9 lindens would be added. Now these slender saplings have been planted, each with a pair of stakes to protect it from Mass Ave's high winds. These 17 new lindens bring to 300 the number of new trees Restore Mass Ave has arranged to date. Why lindens on Mass Ave? The leaders of post-Civil War Washington revered the tree-lined formal thoroughfares of Paris and Berlin. So they landscaped Mass Ave with double rows of linden trees. 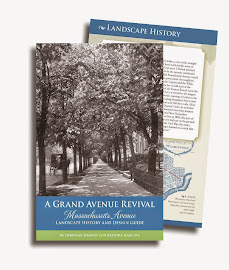 In the 1870s and 1880 linden rows stretched on Mass Ave for five miles across town. When Mass Ave was extended another two miles to Wisconsin Ave, 500 more lindens were added in double rows, in 1904-05. Some of these elderly witnesses still stand - though they won't be with us much longer. fruits of a silver linden on Mass Ave in early summer. walking and riding in carriages under them.